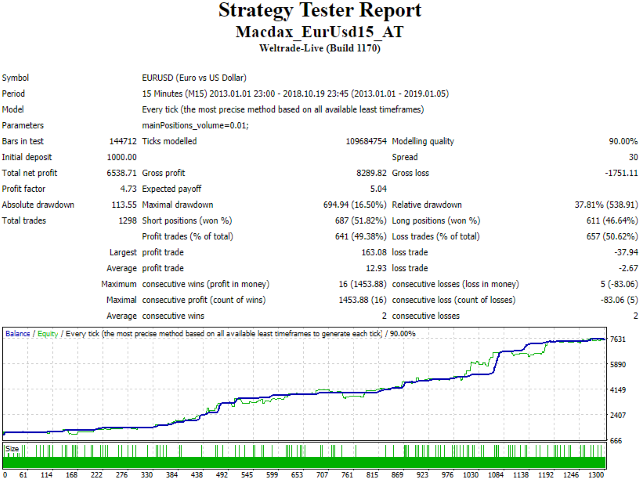 Macdax is a series of fully automated trading advisors based on the MACD indicator. To ensure successful trading, the system is built on two algorithmic modules: "Strategy" and "Positions Management". The module "Strategy" is engaged in the search for quality entry points to the market and the opening of trading positions. For this purpose, data from the indicators are used, the current state of the market is taken into account - a flat or a trend and its direction, as well as a time filter and a market volatility filter are applied. The module "Positions Management" provides support for already opened positions and their closing. The purpose of this module is to close all major positions in profit. To do this, for each main position, if necessary, supporting positions are opened. Macdax EurUsd Averaging is a variant of the expert advisor that is fully optimized and configured to trade on the EurUsd currency pair. The prefix "Averaging" implies that an averaging of unprofitable positions is used as the main algorithm of the management module. mainPositions_volume - the volume to open main position. P.S. There is only one parameter, because in each variant the expert advisor is fully configured and optimized for trading on a specific symbol and timeframe and no longer needs user settings.